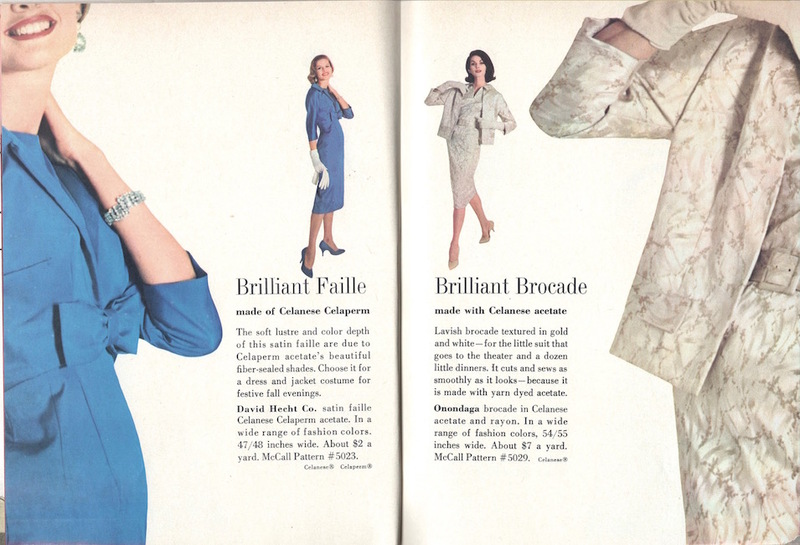 Dovima wears McCall’s 4425 for Celanese, 1959. 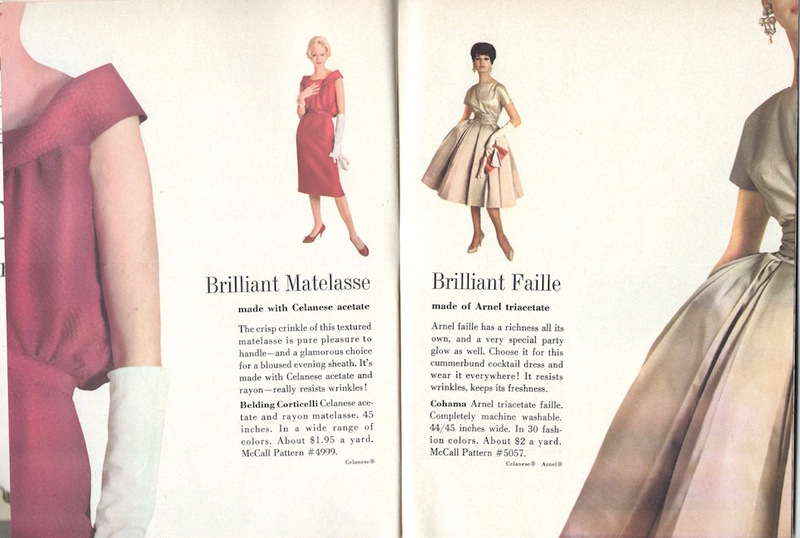 A Celanese advertising insert from the late 1950s shows McCall’s festive styles in the latest synthetic silks—top models and more than one tiara from the multinational chemical company that brought you cellulose acetate. Celanese Contemporary Fibers advertising booklet, Fall 1959. Left, McCall’s 4999 in Belding Corticelli matelassé; right, McCall’s 5057 in Cohama faille. 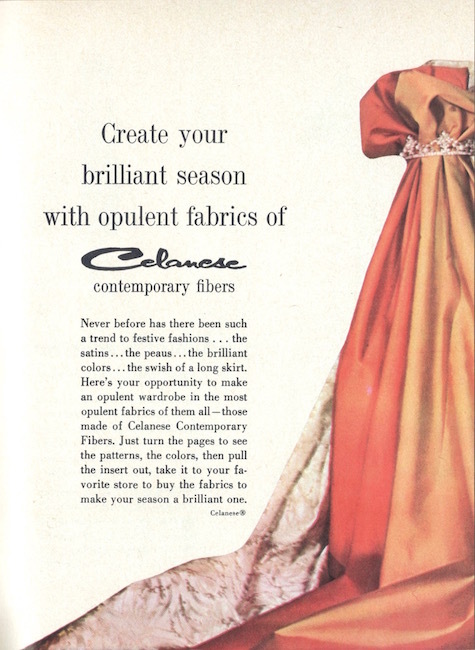 Celanese insert, Fall 1959. Left, McCall’s 5023 in David Hecht Co. satin faille; right, McCall’s 5029 in Onondaga brocade. 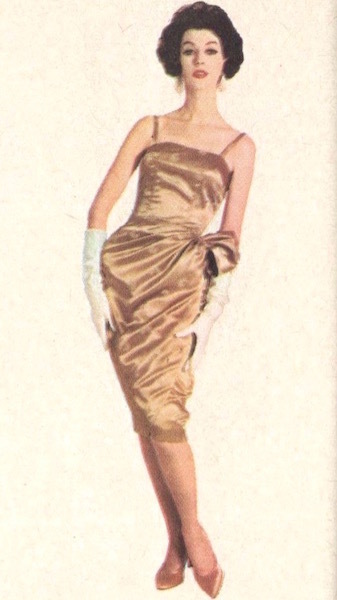 Celanese insert, Fall 1959. 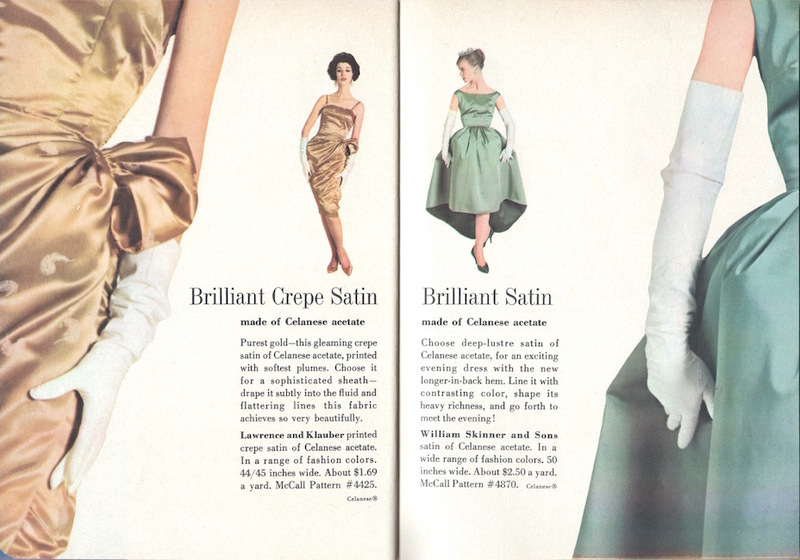 McCall’s 4425 in Lawrence and Klauber printed crepe satin; right, McCall’s 4870 in William Skinner and Sons satin. Celanese insert, Fall 1959. 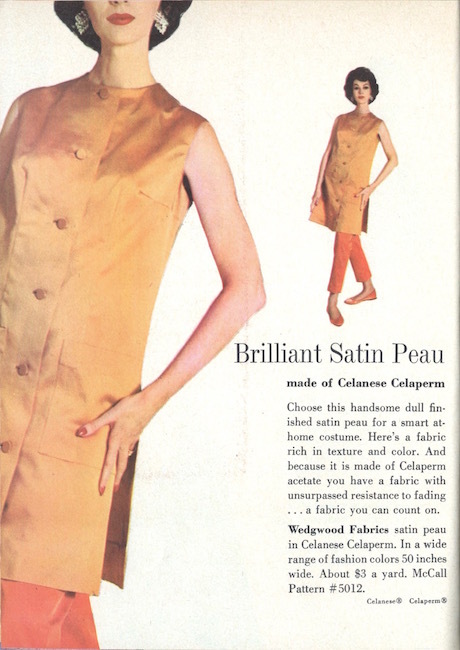 Dovima closes the booklet in McCall’s 5012, an at-home trouser ensemble shown in orange and tangerine Celaperm acetate satin peau from Wedgwood Fabrics. Dovima wears McCall’s 5012 in Wedgwood Fabrics’ satin peau. Celanese insert, Fall 1959. For more on the history of Celanese (est. 1918), see the company website. I would love to have any one of those creations! And somewhere to wear it to! Beautiful! I love these industrial ads! The miracle fiber of the future! Thanks for this and all you do. More better good things for the new year!